If you’re a man age 50 or older, there’s a good chance you’re not interested in keeping up with the latest fashion trends. But even if you don’t hope to seem hip, you would do well to update your wardrobe from time to time. Fail to do so, and it isn’t just your clothing that might be dismissed as out of date. You don’t have to spend a fortune to update your look—adding a relatively modest number of stylish pieces can make a big difference. And if you know which kinds of stores are the best to shop at—and which to avoid—you can buy good-looking, high-quality clothing for almost shockingly low prices. The clothes below will be an easy switch for you. They’re nothing more than dress shirts and sport coats—just not the exact kind you’ve been wearing for decades! Dress shirts with subtle check or plaid patterns. Many men wear only solid white or blue dress shirts. If they own any patterned dress shirts, they’re pinstripes—which were popular decades ago and now look dated. A check- or plaid-patterned dress shirt is a good way to look stylish while still dressing conservatively. Think understated here—the plaid or check should be subtle enough that the shirt’s color looks essentially solid from a distance. 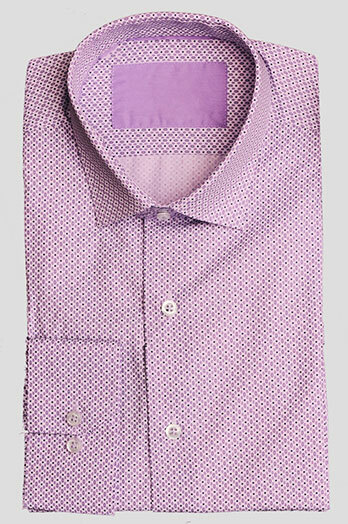 Light pink and lavender checks or plaids are often-overlooked color choices that flatter most men. The cut of a dress shirt makes a big difference—opt for the slimmest cut that fits you. Men who are carrying a few extra pounds often avoid close-fitting shirts, fearing that they will make the weight more obvious. In fact, it’s loose-fitting dress shirts that balloon out from the body that inevitably are unflattering. 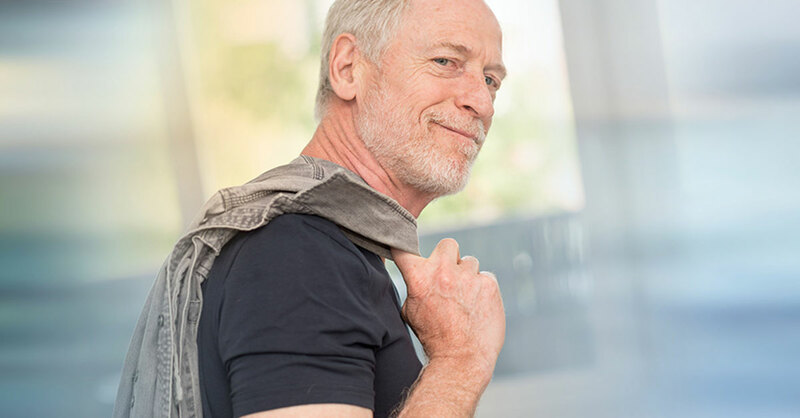 If you wear an undershirt beneath a dress shirt, make sure that it fits close to your body, too, or it will ruin the look of even the best-fitting dress shirt. Keep this in mind: “Slim fit” or “tailored-fit” clothing isn’t only for slim men—all it means is that the clothing, when worn in the right size, fits close to the body. Examples: Dress shirts appropriate for men who are not especially thin include Calvin Klein Slim Fit Dress Shirt and ­Bugatchi Plaid or Checked Shaped Fit Dress Shirt. Stylish dress shirts that flatter thin men include Ben Sherman Print Slim Fit Dress Shirt and Original Penguin Heritage Slim Fit Patterned Dress Shirt. Sport coat with an unstructured cut. If you’re looking for one single garment that will help you look fashionable, a casual sport coat in navy or charcoal gray is the one to choose. You can wear this with anything from a dress shirt and dress pants to a T-shirt and jeans. Unlike most sport coats, a casual sport coat does not have much padding in the shoulders or other structure, so it won’t seem formal when worn with informal garments. Also, a sport coat can be an effective way to hide a stomach that’s expanded a bit over the years. Examples: Banana Republic Slim Blue Textured Italian Cotton Blazer or Slim Navy Stretch-Cotton Blazer…Jachs NY Navy Woven Two-Button Notch Lapel Blazer. Many men opt for comfort over style when they select pants and end up looking baggy and frumpy. You can have comfort and style—just pick fairly close-fitting pants that have some stretch in the fabric, and you won’t feel constrained. Slim-fit sateen pants. Don’t let the word “sateen” turn you off. This kind of fabric weave is related to satin, but it doesn’t look like satin. These are a more stylish replacement for khakis. They’re cut more like slim-fit blue jeans than like baggy, unflattering khakis, but because the fabric has some stretch, they’re comfortable. Example: Calvin Klein Men’s Slim Fit 4-Pocket Sateen Pants. Slim-fit/straight-fit blue jeans with some stretch. There’s no avoiding it—men who want to look stylish in jeans should select a slim fit or straight fit (a little less slim than slim fit) that remains close to their legs. As noted above, you can have both that close fit and comfort if you buy jeans made from denim that has some stretchiness. In this category, smart shoppers can wear some beautifully made higher-end jeans that set you apart from the Levi’s crowd without spending too much more. 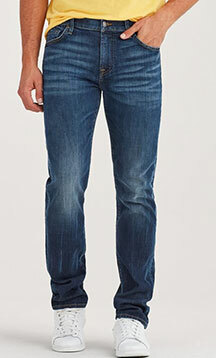 Examples: Joe’s Jeans Brixton Straight and Narrow…7 For All Mankind Standard or “Slimmy” Fit men’s jeans. Stylish shoes make a huge difference in how your overall look is perceived. They can be expensive, but they don’t have to be. Dark-color leather sneakers. Men who want the comfort of sneakers during nonathletic activities should opt for stylish dark leather sneakers. Example: Ted Baker London Prinnc Leather Sneaker. Monk-strap dress shoes. These have a classic dress-shoe look, only with a buckle rather than laces. They’re stylish without being showy. Example: Cole Haan Kennedy Single Monk Strap Oxford. Chukka boots. These look like traditional Oxford dress shoes, but they’re a bit taller, reaching the ankle. They’re a stylish twist on a classic, conservative shoe. 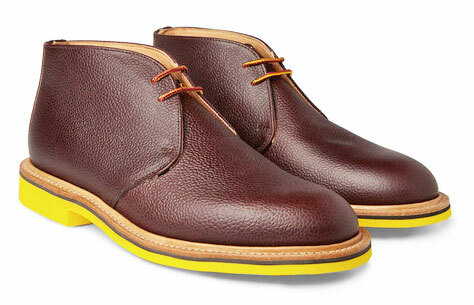 Examples: Steve Madden Ivon Chukka Boot…English Laundry Ascot Wingtip Chukka Boot. Socks that make a statement. This isn’t for every man, but if you want to inject some personal style and fun into your wardrobe without spending much, distinctively patterned socks are one way to do it. 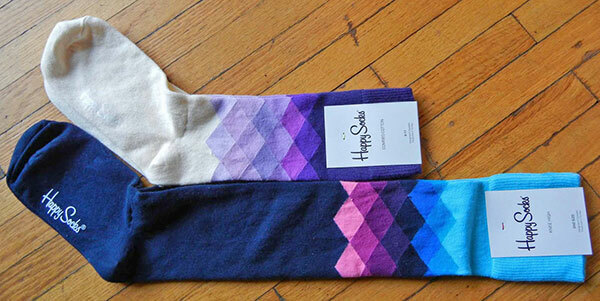 Example: Happy Socks offers dozens of distinctive patterns, most for $12 to $24 (HappySocks.com). As most women know but most men never think about, little touches can make a big difference in looking good. Leather (or faux leather) slide belt. Slide belts have no belt holes but instead a hinged clasp, and most have classy, understated buckles. 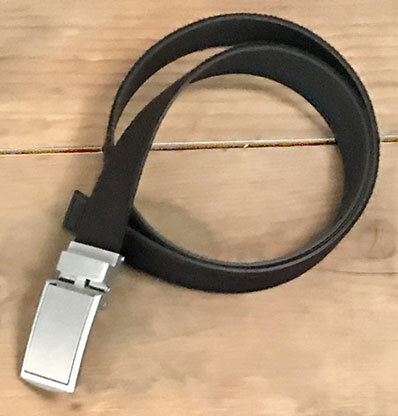 Unlike traditional belts, slide belts tend not to develop as obvious a line where the buckle rubs against the belt, so if you put on a few pounds and need to wear your belt a little looser, it won’t be as apparent. Example: SlideBelts Classic Black Belt ($38, SlideBelts.com). Pocket square and/or flower pin. Pocket squares are a stylish but not over-the-top way for men to add a little color to their outfits when they wear a suit or sport coat. Fabric lapel flower pins are in style these days, too. Your best bet is to get one that is less than two inches across and not too brightly colored, so it won’t be too showy. The traditional option is to select ones that are (or include) a color that’s in your tie, but you also could match the color of your socks or shirt…or for a bolder look, select a color that complements the color of the shirt rather than matches it, such as orange with blue. Examples: Ben Sherman Tie, Pocket Square and Lapel Flower Stick Pin Sets…Original Penguin Hall Solid Pocket Square & Lapel Flower Pin Set. These are sold as sets, but you don’t have to wear the pocket square and flower pin at the same time if that seems like too much. Shop at mid-tier clothing retailers whose house brands are a cut (or two or three) above those of most department stores—these include stores such Brooks Brothers, Banana Republic and others mentioned above. And when these stores have sales, the price-to-quality ratio is extremely good. Shop at the discount arms of high-end department stores, where lots of initially expensive, very high-quality garments are marked way down because they didn’t sell during their first few months on store shelves. These include Nordstrom’s Nordstrom Rack and Saks Fifth Avenue’s “Off 5th.” These stores also feature clothing made to the same high standards as the parent store’s brand but in slightly different patterns or styles. Remember that if your goal is to look up to date, not trendy, last season’s or last year’s styles are a very good choice for both looks and price.